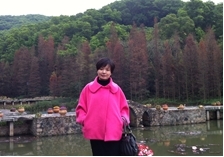 Dr. Yuhua Zhou (Eva) is currently a Research Fellow at UCLan’s Biomedical Technology (Shenzhen) Ltd. She received her Master degree under the supervision of Prof. Guichang Wang in Physical Chemistry from Nankai Univeristy, Tianjin, and PhD degree in Theoretical Chemistry with Prof. Xin Lu from Xiamen University in 2008. From March 2009, she spent two and half years as a postdoctoral researcher under the supervision of Prof. Habin Su in Nanyang Technological University. In October 2011 she joined our Shenzhen Modeling Centre under Dr. Marco Pinna’s supervision as a Research Fellow. Her research interests include computational chemistry and material science, heterogeneous catalytic reactions. Her current research focuses on modeling the interactions between peptides and biological membranes.